I cannot thank you enough for compiling this information and stating these issues in such clear, concise, efficient terms. We try to explain this to people: some want to be educated, are interested in what we have to say on these issues, and are concerned with what they hear. Some people get angry, and literally say to us, “Well, I don’t care.” Some care but are ultimately lazy and do what is convenient — which is, too often, using Amazon, since Amazon has HUGE resources at its disposal now, and can streamline shipping, website searches, inventory availability, etc. We are here to offer a better alternative, but so many times, it seems spitting in the wind. Thank you for the boost, and the information to fight back. Very well done! Thanks for creating this graphic. Okay then, so you do realize those of us in rural areas with little shopping availability use Amazon quite a bit. Do you have alternatives for those of us in the middle of nowhere. Sure, we’d love to buy local, but many times that is not possible. Very well done. Members of Congress should be able to understand this. What does Amazon spend in political campaigns? It would be great to show how any influence there helped shape this story. Thanks for the comment. Yes, of course, we know avoiding Amazon is not always possible. That’s part of the concern we’re raising: a lack of meaningful choices for people. There are some independents online. For example, you can order both print and e-book titles from independent bookstores via http://www.indiebound.org/ and independent hardware stores have a e-commerce site through their cooperative, Ace: http://www.acehardware.com/. There are others as well. We have also advocated an end to the subsidies states have provided Amazon and other big retailers for the construction of warehouses and stores. And we advocate for stronger enforcement of antitrust laws to ensure a diverse marketplace where people have choices and where small businesses have an opportunity to compete. Amazon spent about $2.2 million lobbying at the federal level in 2011. During the 2009-10 election cycle, they donated about $210,000 to federal candidates. I haven’t checked their state activity…. Well done, thank you for posting this, what potent information! 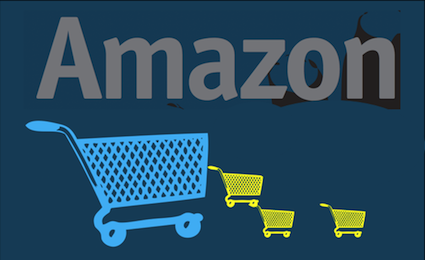 Wonderful facts that reveal corrupt executive greed… Amazon is scary for our economic future! Is there a published source for saying Amazon spent $2.2 million on federal-level lobbying in 2011? In the “Sell your products at a loss” section, it says Amazon “spent nearly a decade pricing its goods below cost.” If the company started in 1995, then that statement suggests that Amazon hasn’t been selling below cost for 8 years. We know that isn’t true. Amazon often offers new books at lower prices than I as a bookstore can buy them for. Secondly, I don’t think it makes a strong enough statement about the effect on publishers of Amazon controlling the retail side of the marketplace. Amazon is going to end up telling publishers how much they will be paid for their books. Amazon will then control both sides of the marketplace, meaning there won’t be an American marketplace of ideas, just whatever Amazon decides to make public. What’s nice about infographics is that they are concise and portable, so they spread across the web with great speed and reach. But the problem with tackling complex subjects in a concise format is that you inevitably must summarize and lose a level of detail. But tough to fit this all into an infographic and cover the range of issues we wanted to touch on. Can you add a bibliography or a link to the sources?